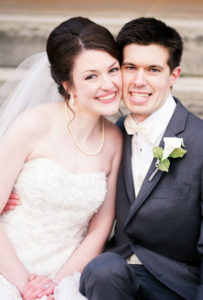 Lauren Taylor Evans became the bride of Caleb Alan Wycoff on June 4 at St. Paul Catholic Church in Salem. The bride is the daughter of Scott and Leslie Evans. Her grandparents are Dave and Kathy Hartman and Larry and Peg Evans. 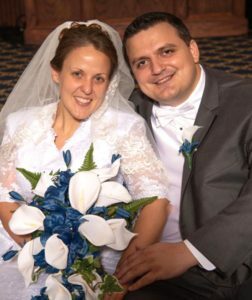 The bridegroom is the son of Leonard and Lisa Wycoff and the grandson of Vicki Vallor, the late Edward Vallor, Jim and Rosalie Luckino, and the late Robert and Martha Wycoff. The Rev. Robert Edwards officiated at the 1:30 p.m. ceremony. 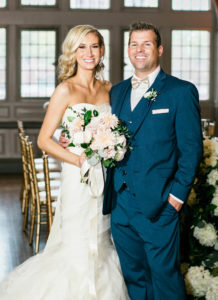 Caitlin Elkins served as maid of honor. Bridesmaids were Adrianna Sanchez, Crystal Richards, Kayla Kemats, Samantha Wilson, Abbey Brammer, Chelsea Seidner, Rachel Wycoff-Thomas, the bridegroom’s sister; and Staci Medved. The flower girl was Molly Miller, the bridegroom’s cousin. 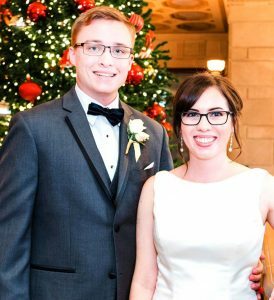 Seth Wycoff, the bridegroom’s twin brother, performed the duties of the best man. Groomsmen were Jacob Wycoff, the bridegroom’s brother; Aaron Sweeney, Vincent Browne, Chad Cope, Joshua Cox, Justin Madison, Aaron Thomas, the bridegroom’s brother-in-law; and Michael Evans, the bride’s brother. Ring bearers were Landon Newbold and Silas Coldwell. Sujata Wycoff, the bridegroom’s sister-in-law, recited a reading. 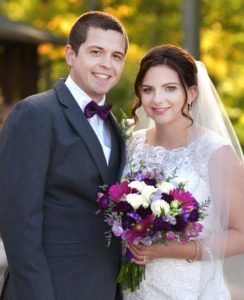 The reception was held at Mr. Anthony’s Banquet Center in Boardman. The rehearsal dinner was held at the Salem Golf Club.